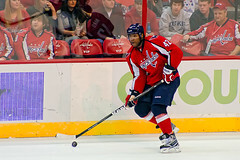 It took a split second for Joel Ward to become a playoff hero to Washington Capitals fans. By the time the Capitals were done celebrating Ward’s overtime goal that knocked the Boston Bruins out of the playoffs; Ward was the center of a different emotion online. Immediately following the goal Ward, who is a black Canadian player, was the target of irate fans using racial epithets and slurs on Twitter. What these people have said and done is unforgivable. I hope they are now publicly identified and pay a huge price for their beliefs. There should be zero tolerance for this kind of hate mongering. Their messages should now stay glued into the algorithms to place a forever warning and a mark upon these people and their actions. They shouldn’t be able to escape their keystrokes. While Leonsis’ opinion may sound extreme, it is not too far from what is possible, given the data that is shared on social networks. I am sure that the majority of the folks who Tweeted out this vitriol thought they were being snarky or funny to their friends did not realize the reach of what they Tweeted. In reality their Tweets have went well beyond that network. This is 2012 and the whole naivety around social networks needs to go away and these rants only further showcase how society in general is clueless as to the reach of what is said online. There is a clear line as to decency and what is acceptable out in public – where users of social networks not only reflect themselves, but also their employers. With all the ugliness aside, I do think that this incident offers some real teaching and learning experiences for everyone who congregates on a social network at any given moment. Education is key – Before sharing something on Facebook, Twitter, Instagram, Path or a blog, take a step back and think about how that can be seen by others. This also includes looking at the individual network privacy settings and how your content can be used. And don’t forget that whatever you post can be forwarded, reposted, copied, etc by those in your network regardless of your privacy settings. Online = Offline – Do you ever think about hitting send on a Tweet or status update? Chances are that more times than not you don’t. It is easy to voice your opinion because a social network is all about you and how you interact with friends. What many people do not realize is that employers are looking at these updates and can, at times, deny or terminate employment because of what was posted. Many of the folks who tweeted out these posts might be marked as Leonsis suggested and denied employment due to the beliefs that they made public. Words can hurt you – The old adage of sticks and stones breaking bones and words never hurting you rings false when it comes to social media. There have been a number of people fired for their Tweets and one of the Tweeters in the Joel Ward incident is currently facing punishment from his school in Massachusetts. At the end of the day, we may all be entitled to our opinions, but employers and schools reserve the right to punish those who use a public platform to voice outlandish thoughts and hate speech. While I know that these three points might seem basic, it appears that they still need to be said because so many people just don’t get it. @jeffespo That display was beyond belief. Made me wonder if we’d gone back in time. Shame on people. @jeffespo Great post Jeff. Could see that firestorm coming when watching the game unfortunately. @jeffespo no excuse for being stupid to an audience of millions. @jasonkonopinski @ginidietrich @jeffespo sadly, its not the first of its kind that I have read about from Boston fans. @Tinu @jeffespo wow! Thought folks had evolved out of such behavior. Uncool!unacceptable! Jeff, I applaud you for touching an issue a lot of people are afraid of, and for extracting teachable moments from it. Can’t say I’m surprised by prejudice behavior, no matter which race it comes from, but I certainly am appalled. Even more disturbing is that in this day and age, people still think the web is this magical,, imaginary land where actions have no consequences. @TheRedDogInn @jeffespo There are lots of people who’ve grown past prejudices, but I think we have a generation or 2 before racism is rare. @Tinu you said magic, heh. I am actually surprised there wasn’t more made of this. And while I am not overly surprised, my wife was listening to talk radio up here in it and an African American journalist noted that he thinks that the generation that mostly Tweeted this does not know the impact of the words mostly because of culture. I think its kind of a cop-out of sorts, and I can say if this were my kid they would get the snot slapped out of them. @byron_fernandez @ginidietrich Those are unforgivable actions – regardless of emotional influence. Reminds us how stupid people can be.